President Donald Trump suggested Thursday that the GOP could postpone his immigration-and-amnesty push, and instead pass a no-compromise immigration rewrite in 2019. 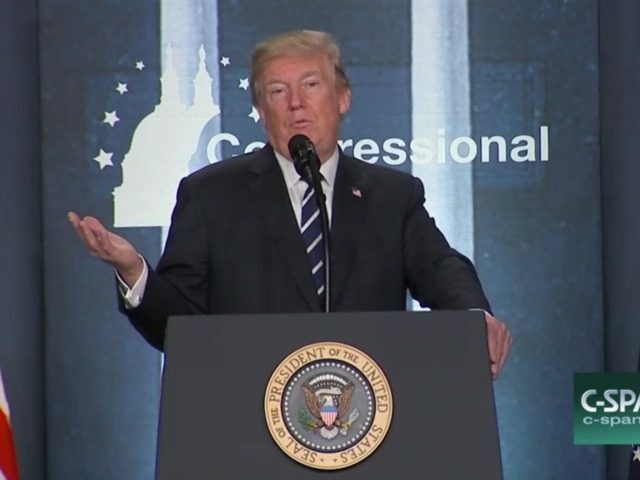 “We have to get help from either side [to pass a bill in 2018] — or we have to elect many more Republicans,” Trump told GOP legislators gathered at the Greenbrier Resort in West Virginia. Really, that is another way of doing it. And based on the [election related] numbers we just saw, we have a real chance of doing that … [Immigration] is now an election issue that will go to our benefit, not their benefit. Trump’s suggestion is a 2018 threat to Democrats largely because Trump’s immigration priorities are far more popular than the Democrats’ pro-migrant, cheap-labor policies. By focussing the 2018 race on the nation’s current cheap-labor economic strategy, Trump could reanimate the blue-collar base that carried him to victory in 2016 and also trump the Democrats’ base of revenge-seeking liberals.